The circumstances surrounding the Osun 2018 governorship election hold crucial lessons for the building of a political alternative of the common and working people in Nigeria. The results also came across as a rude shock to the political establishment in the country. Although the candidate of the All Progressives Congress (APC), Gboyega Oyetola, was declared as the winner of the race, he and his party lost the legitimacy to govern the affairs of the state. 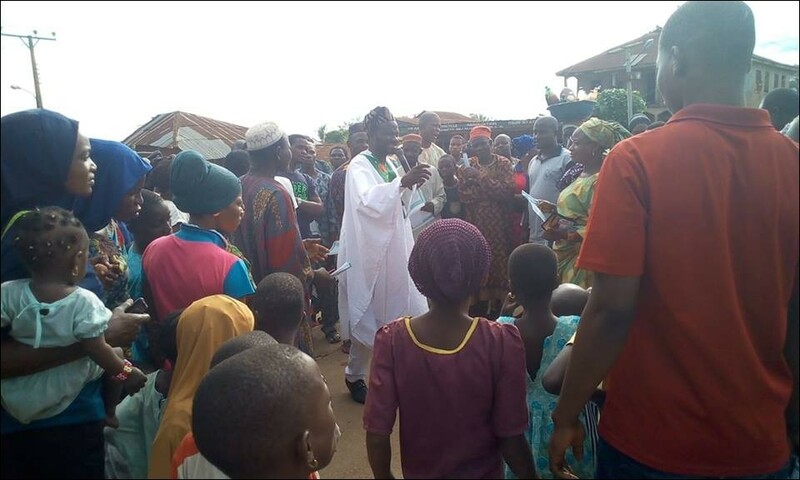 Indeed the election showed that Osun people had rejected the outgoing Aregbesola government, the APC and their policies. The participation of the Socialist Party of Nigeria (SPN) in the election, although underreported in the media, was significant as it provided socialist positions on issues affecting common people; and to that extent, the SPN's intervention singly added quality to the election by compelling attention on issues that daily confront working-people households and families. Based on the figures released by the Independent National Electoral Commission (INEC), no party received more than 32% of the total votes cast, including the APC that was eventually declared under controversial circumstances as the winner of the election. In fact, both APC and PDP got less than 21 percent of those who had voter's cards. About 400, 000 voters' cards were not claimed by their owners prior to the election out of a registered voters' figure of 1, 682, 495. Out of over 1.2 million people with voter's card, only 815, 798 voters participated in the September 22 election, about 69.8 percent of those with voter's cards. Thus only just over half the registered voters were recorded as having participated in this election. After the September 22 voting, based on the pronouncement made by INEC, no party emerged victorious in the election. The PDP and its candidate, Ademola Adeleke, were leading by 353 votes with 254, 698, with the APC trailing behind with 254,345. INEC had predicated its decision not to declare any clear winner on the fact that the PDP's margin of victory was lesser than the total number of votes in seven disputed polling units across four local government areas. After the rerun election conducted in these seven polling units on September 27 (five days after the main election), the APC candidate, Gboyega Oyetola, was declared by INEC as the governor-elect and winner of the election. However, several reports have shown that the rerun election was more of a farce than election, with not just voters violently prevented from voting but observers, agents and journalists also subjected to ill-treatment and violent harassment. The police and other security agencies were reportedly looking the other way while thugs of the ruling APC party perpetrated brazen violence on people. Although the main election was adjudged as free, the media were inundated with reported incidents of voters' inducements, involving both the APC and PDP. It is significant that the APC, the political party that has governed the state for the past eight years, depended on vote-buying and voters' inducement to get its share of the votes. INEC might have declared APC's Gboyega Oyetola as the governor-elect from the exercise, but it is clear from facts that have emerged from the elections that APC lost every claim to legitimacy in this Osun election. The APC's share of the vote after the rerun election, 255, 505 votes, is less than 21 percent of the registered voters with voter's cards, and worse still, less than 60 percent of those with voter's cards but abstained from voting. In fact, Oyetola won just 31.3 percent of the total votes cast. It is clear from the facts and figures of the Osun election that the APC got its 'mandate' to govern the state for another four years from a small fraction of the electorate. The fact that the APC has governed the affairs of the state since 2010 further portrays the election as a report sheet of the eight years of APC/Aregbesola administration. And the APC failed woefully in that regard. Nothing exemplified the illegitimacy and unpopularity of the Aregbesola/APC government than the fact that while Aregbesola/APC led its immediate rival, Iyiola Omisore/PDP with over 100, 000 votes in 2014, the APC had to struggle, using brazen violence, vote-buying and rigging to get less than 500 vote lead over the previously-rejected PDP in just 4 years later. Even, the 2014 result showed the weakness of the Aregbesola government then. As we stated then, the vote differential of over 100, 000, rather than showing the popularity of Aregbesola/APC government, actually revealed its weakness. The government spent billions of naira on campaigns, advertisement and inducement, aside using all available state apparatus to mobilise votes, yet its closest rival, Iyiola Omisore of the PDP, who was more or less a politically loathed politician, garnered over 200, 000 votes. As we warned then, that Aregbesola government would be living in fool's paradise to think it can continue with anti-poor policies and not face popular revolt. This revolt was expressed not only in the various protests, strikes and mass actions of workers, pensioners, medical doctors, lecturers and students, but also in the voters' revolt witnessed in this 2018 governorship election. Behind the popular rejection of APC and its candidate are the anti-poor policies implemented by the government in its eight year tenure. These policies were accentuated in the last four years with the government owing over 30 months arrears of half-salaries and half-pensions. Education and health sectors are in terrible conditions while the government squandered over N200 billion of borrowed funds on inflated contracts. Is the PDP Real Alternative? While the PDP is already at the Election Petitions Tribunal to challenge the outcome of the election, several other opposition parties have adopted the APC in the period between the stalemated election of September 22 and the September 27 rerun election. The PDP that emerged as the runner-up in the election offered no coherent programme other than the condemnation of the ruling party; its emergence as runner-up even reflected the deep dislike the people have for the APC. Indeed, the PDP and its candidate, Demola Adeleke are not different from the APC. In fact, Demola Adeleke, and his late elder brother, Senator Isiaka Adeleke, were former members of APC. They did not stand in support of workers and retirees when the Aregbesola government failed to pay salaries and pensions. They did not openly oppose all the anti-poor policies of the Aregbesola government. Adeleke only disagreed with APC when he was denied his brother's senatorial ticket. He later defected to PDP and won the bye-election to replace his late brother. Demola Adeleke is also a beneficiary of rotten godfather policy, with his billionaire brother, Deji Adeleke as a major financier of his governorship ambition. No doubt, the state treasury would have been turned into private purse of the Adeleke family, had he emerged the governor, the same way the state purse has been handed over to political godfathers in APC by Aregbesola government. Aside relying on communalist zoning arrangement and sympathy votes of his brother, Adeleke and PDP had no selling point programme. He already had baggage of certificate forgery hanging over his neck. He partially benefited from anger of workers, pensioners and the people of the state, who are fed up with Aregbesola/APC government. But by scoring only about 32 percent and winning in 11 out 30 local governments when he was leading before the rerun also shows Adeleke did not a enjoy mass support in the election. Indeed, each of the two parties were rejected by about 68 percent of the voters. The intervention of the Socialist Party of Nigeria (SPN) enriched the whole election process, despite the unfavourable difficulties of running an issue-based campaign in a highly-monetized electoral system. The years of intervention of the SPN and the Democratic Socialist Movement (DSM), in the struggles of the working people over the years, conferred on the party and its candidate a moral authority to speak on the same issues they have sided with the working people on for so many years. Amid the flurry of insincere promises to pay salaries and focus on welfare of common people made by political parties, the campaign of the SPN put these issues into perspective and debunked the myth that the state government cannot combine infrastructural development with the obligation of paying workers' salary and bring prosperity to every home. The SPN campaign was premised on socialist programmes including mass investment in social services like free and quality education and healthcare, affordable and accessible water supply, public mass housing, massive road construction, modernized and mechanized, poor peasant friendly, public led agriculture and agro-allied sector, etc. 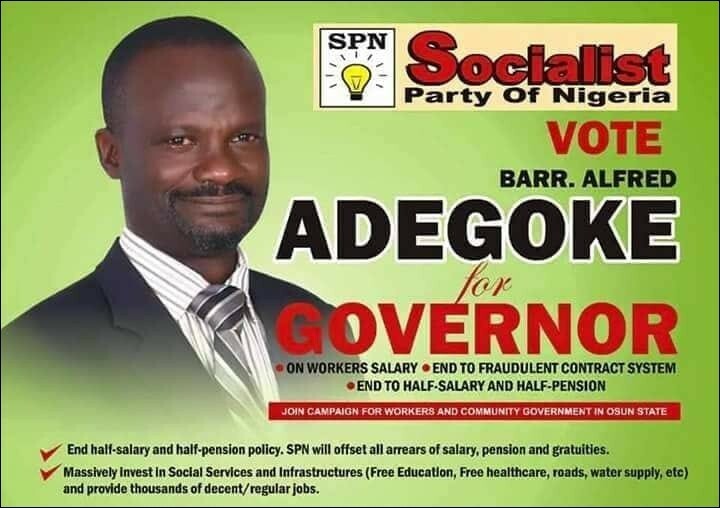 The SPN and its candidate, Alfred Adegoke, maintained that, in order to help fund these programmes, a socialist government will end the fraudulent contract system, which has become a conduit pipe for massive looting of public funds. In fact, much of the debts the state owes are due to inflated contracts, especially roads contracts. Rather than hand over public resources to private pockets, such a government would equip the public works department with adequate machineries and manpower through employment of thousands of workers into decent and pensionable jobs. Aside abolishing the contract system, the SPN laid emphasis in its programmes and manifestos on the principle of the party to place political office holders serving under the platform of the party on the average wage of professional civil servants. This among other programmes distinguished the candidate of the SPN throughout the campaign. The Electoral Commission declared that the SPN garnered 391 votes from the thirty local government areas of the state in the gubernatorial election. This figure, though small, was significant for the SPN considering the deep purses of our opponents, and the highly monetized electoral system the SPN participated in. 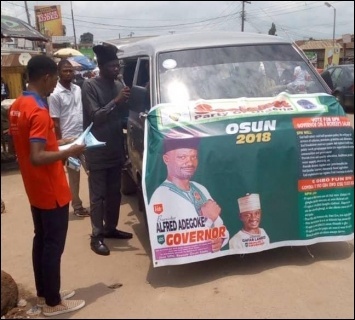 For example, the state-owned Osun State Broadcasting Corporation had written to the party demanding a whopping sum of N500, 000 in order to present the party with a platform to reach out to voters with its programmes and manifestoes. Meanwhile the party prosecuted the whole campaign with barely N400, 000, from donations from party members and supporters across the country. Most of the media houses (print and electronic) blacked us out, save for few like Premium Times. The Electoral Law and the nation's broadcasting guidelines have provisions that require the media to treat parties equitably in the coverage of political or electioneering campaigns. But the major criterion for media coverage of this particular election was the wealth of the parties, which gave the same characters and political parties that are wealthy from their plundering of the state's resources a monopoly of media access and effectively blocked parties without millionaires from taking advantage of the media. In essence, the media's approach to coverage of the election can be summed up as "if you are not rich, you can't be heard." The SPN with the meager resources it raised printed thousands of leaflets and posters expressing the programmes that distinguished it from the others. In a political culture where campaign rallies are perceived by the electorate as an avenue to earn some free money from politicians, the SPN's campaign was a striking example that engaged people on the streets and in workplaces on issues. From Osogbo to Ile-Ife, Modakeke, Ilesa, Ikirun, etc., the SPN campaign received support of working class people in workplaces and communities. We circulated leaflets at workplaces including government secretariats. Where we were given media space for debate, our candidate, Alfred Adegoke, argued out our programmes and distinguished himself from the pack. Irrespective of the limitations of our campaign in terms of resources, manpower, media access and monetization, our street campaign and limited media presence provided us some reach. For instance, we got some votes in some towns like Ejigbo, Ede, Iwo, Ife South, etc., where we were not able to reach due to limited resources. In fact, there was no local government where we did not get votes. Given the heavy monetization not only in terms of billions spent on campaigns, but also billions spent on voter inducement by main bourgeois parties, our votes, no matter how little is significant. Our work in the Ife area earned us almost a quarter of our total votes. Despite not having money for media coverage, the SPN was able to appear in at least five electronic media, and four print media. Out of the 48 parties that participated in the election, the SPN's share of the vote put us ahead of 21 other parties, including the Labour Party. Some of these parties had more resources than SPN, and many of them have been registered many years before SPN. The chief advantage of the SPN's intervention in the election is in the fact that the party now has more people from different areas of the state, who shall be crucial to the task of expanding the frontiers of the party in the coming stormy period. Forty eight political parties contested in the Osun election, but the media had narrowed down the contending political parties to five; that is, the APC, PDP, ADP, SDP and ADC. The basis for the media selection of the so-called major contenders was the fame and wealth of the five candidates representing these parties, who have held one political office or another in the state in the past, and have been part of the rot that has defined our society. There was no doubt that this media bias against the other parties affected the consciousness of voters, who had been systematically restricted to choosing among five parties that the media vaunted as "serious contenders". The historic intervention of the Socialist Party of Nigeria, among other factors, was significantly mitigated by this undemocratic and inequitable coverage of the electioneering campaigns by the media. The party was already prominent in the campaign against non-payment of full salary of workers and pensioners before the election. The candidate of the SPN, Alfred Adegoke, as the Chairman of the party in Osun State in 2016, was arrested for signing statements that called on workers to organize mass actions against the policy of payment of half salaries. However, the cooperation of the leadership of the organised labour with the APC government dampened the morale of workers, and made many to look up to the election as the nearest opportunity to evict the APC government. Expectedly, promises to pay workers' salary became a singsong among the candidates that contested in the election. Workers must have watched with incredibility as elements that have served in senior positions in the outgoing APC administration, such as Adeoti (of the ADP who served as Secretary to the State Government) and Oyetola (of the APC who served as the Chief of Staff to the Governor), became fervent believers in the policy of payment of full workers' salary. In the coming months, the APC government will be unable to resolve most of the existing economic and social problems. The state currently owes over N200 billion as debt. About N2.4 billion, out of about N4 billion federal allocation to the state, is deducted from state allocation monthly to service debts. This is aside over 30 months arrears of half-salaries and half-pensions owed workers and retirees by the government. Most of the projects upon which debts worth tens of billions of naira were incurred have remained abandoned and uncompleted. Obviously, the government will have to force down the throat of workers, pensioners and youths, many anti-poor policies in order to satisfy its backers. The coming period of Oyetola/APC government, if it is not thrown out by the election tribunal, will be that of serial attacks on the working people. But the workers and the poor will not sit back without a fight back. Irrespective of who emerge as labour leaders, especially in the coming NLC elections, workers and the poor will have to fight to win lost rights, and defend their rights. Alongside the fight for full payment of salaries and pensions the enactment of new minimum wage could usher in a new period of radicalization among workers, especially if it is not fully paid or accompanied by a fresh wave of retrenchment. Therefore, the role of SPN and DSM in the coming battles will be important. Most of the 48 parties that contested in the election have already closed stalls after the contest, and would not be available to champion the cause of the common people until the next election is around the corner. This also shows the insincerity in the programmes and actions of some of these parties that had condemned the APC fervently for oppressing the common people, and later rallying round the same APC to secure victory for its. The candidate of the SDP, Iyiola Omisore, who was more brazen in his condemnation of the APC, later capitulated to the same party. He publicly endorsed the APC candidates for the rerun election citing the promise of the APC to include the SDP in a unity government.